President Trump in the East Room of the White House on Wednesday. Attorney General Jeff Sessions and White House chief of staff John Kelly are among a dozen Trump administration officials accused Wednesday in a federal lawsuit of conspiring to separate Central and South American families at the Mexican border to deter unlawful immigration. Now, the government should be forced to pay for the consequences of the untold pain and stress it intentionally inflicted on children, according to lawyers representing two Guatemalan families who were separated under the president’s “zero-tolerance” policy toward migrants crossing into the United States illegally. 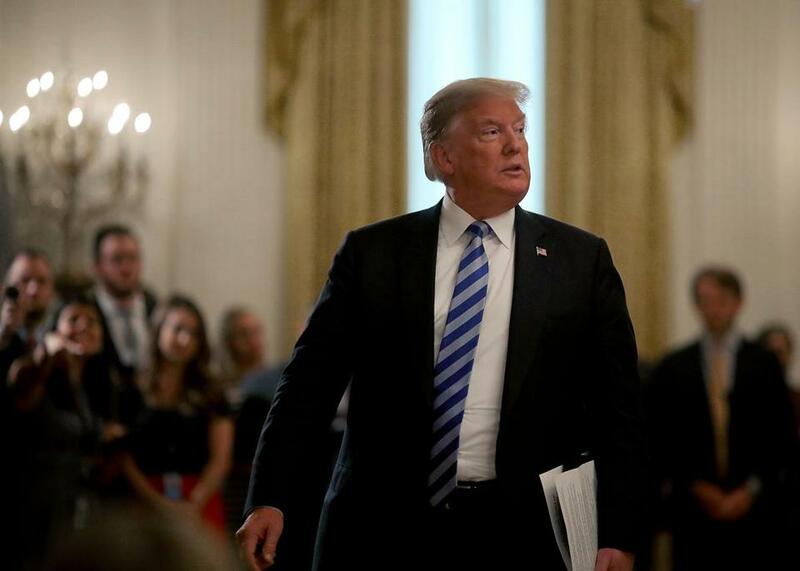 The lawsuit, believed to be the first claim for compensation for the more than 2,500 children taken from their parents under the Trump administration policy, seeks unspecified damages to create a mental health fund to pay for therapy and treatment. “These families . . . have been treated so inhumanely, so cruelly, and so inconsistently with the principles of this country that this lawsuit has been filed on their children’s behalf to seek redress for the damages that their children suffered,” Susan Church, a Boston immigration lawyer, said Thursday. She is one many attorneys who filed the lawsuit and gathered at the law offices of Todd and Weld in Boston Thursday to announce the complaint. The lawsuit, filed in Worcester, also names President Trump senior adviser Stephen Miller, Department of Homeland Security Secretary Kirstjen Nielsen, and officials with Immigration and Customs Enforcement and Border Patrol. Representatives for ICE and Border Patrol declined to comment, citing the pending litigation. Phone and e-mail messages left for Sessions and White House officials were not returned. The complaint was filed on behalf of two Guatemalan families now living in the Worcester area who were detained and separated after crossing the border earlier this year to seek asylum in the United States. Their lawyers identified them only by their initials because the immigrants, who said they were fleeing violence, fear retribution if they are sent back to Guatemala. In one case, a mother was separated from her two children, a 17-year-old boy and 9-year-old girl, after they arrived at the Texas border in May. Agents took the mother to a Texas holding facility, the lawsuit alleged, while the children were kept in a freezing room where they were frequently mistreated by the staff. The girl, now 10, said federal agents would wake her at odd hours in the morning by yanking on her ponytail and ordering her to bathe. Her brother said a federal agent kicked him in the back 10 times because he refused to believe the teenager was 17. When the children they were detained with would cry, federal agents insulted them in Spanish, according to the lawsuit. “Shut up, you trash!” they yelled, the lawsuit alleged. The siblings were reunited with their mother and father five weeks later, but the younger child still wakes up crying at night, afraid someone will grab her hair. Their mother wept Thursday at the press conference as she recalled what she and her children endured. She recalled the mothers of children younger than her own who cried and begged officials for answers about where their children were. The other family filing suit, a father and his 11-year-old son, were at first kept together in a detention center after they crossed the border in El Paso, Texas, in June. The center was cold, and they were given little food, just one burrito to share twice a day, the suit said. When the father asked the border patrol agents for more food, they said no. “You’re not here to get fat,” they said, according to the lawsuit. Three days later, they were separated when the father was taken to court and told he had committed a federal crime by entering the country illegally. He would not see his son for 36 days. When they were reunited, the son told his father he had been struck by another child who had been separated from his family, the father said at the press conference Thursday. At night, his son still dreams the boy is chasing him and leaps out of bed to escape, the father said. Church said immigration lawyers have seen children so stressed they have bitten their nails until their fingers bled. Jesse Bless, a Salem lawyer whose firm is also involved in the suit, said one 5-year-old client who was reunited with his mother in Philadelphia has regressed severely and now demands to be breastfed. “The damage is unbelievable,” Bless said. Church said there are at least 20 families who were separated at the border and live in Massachusetts. Church said the families from Guatemala did not enter the country illegally because they identified themselves at the border as asylum seekers. That status, however, means they are not entitled to health benefits and cannot get a driver’s license, which makes access to mental health care nearly impossible, she said. Lawyers for the immigrants are seeking to certify the class-action lawsuit so that all children separated under the policy, as well as children who could be separated in the future, would be represented in the case. The lawsuit contends that Trump administration officials violated the due process rights of the immigrants by separating children from their parents and subjecting the children to punitive conditions. It also alleges that the policy discriminated against Central and South American families. The lawsuit references comments made by Trump about Mexicans, whom he has called “criminals” and “thugs,” and his reported reference to places such as Haiti and El Salvador as “shithole countries.” The complaint also cites comments that Miller, the Trump adviser, once made as a teenager about the lack of English skills of Hispanic students. Miller has been identified in several media reports as the “architect” of the separation policy.